Starlette DeFore as spent the last decade trying to solve the mystery of her father’s disappearance. 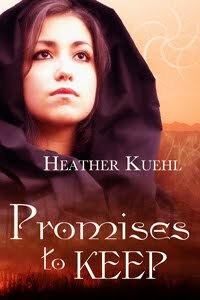 In the opening chapter of Promises to Keep, she gets the break she’s waiting for when one of the faeries she has been hunting spills a name—Sivad Night, of Randa, South Carolina. Starlette, the mysterious Sivad, and a witch named T.D. journey to Verella, the land of faeries and other fantasy creatures, and are greeted with a surprise attack by servants of the sorceress Dreashae. From there, things only become more exciting. Starlette and Sivad encounter centaurs and a Pegasus, come between warring dragons, and finally wager with an evil power even greater than Dreashae. Starlette makes a witty and likeable narrator, and her very human reactions to the fantastic occurrences in Verella keep the story fresh. I enjoyed the subtle twists on standard fantasy creatures: dragons who terrorize each other instead of hapless human villagers, for example. My one criticism is that this book is too short—only 91 pages. A number of background events, such as the circumstances surrounding Ronan DeFore’s disappearance, could have benefited from a more in-depth treatment, and some incidents in Verella—such as the Pegasus who is owned by a centaur, though a centaur clearly can’t ride horseback—raised questions that remained unanswered. This threw me in earlier chapters, where I kept expecting the explanations to be expanded on in more detail. However, by the end of the story I was caught up in Starlette’s adventure and appreciated the quick pace. This is the perfect book for the fantasy fan who wants to kick back with an adventure but doesn’t want to dedicate weeks to a 500-page doorstopper. Its small size and strong focus on plot make it a good read for a commute or a day in the park. As a bonus, the gorgeous cover art makes a great conversation starter when strangers want to know what you’re reading! I you enjoy Promises to Keep, you might enjoy Heather Kuehl’s story “Struck by Beauty,” which appeared in the Autumn 2009 issue of Mirror Dance. Promises to Keep can be purchased through Eternal Press and Amazon.com. Megan Arkenberg is the editor of Mirror Dance and its sister publication Lacuna. Her own work has appeared in interesting places like Clarkesworld and Ideomancer. Find her bibliography at http://meganarkenberg.webs.com.